We will start by saying that we don’t force customers to buy hardware from us and if you really want low cost nun-rugged mobile computers we won’t be able to supply them as your purchase price would be the same as ours. We evaluate a range of devices before deciding to adopt a particular device. This often results in many devices being rejected as we find minor issues with them, but when you want to offer the best to your customers you simply have to be a bit brutal with potential suppliers. An Authorised Re-seller Agreement – this gives us access to the Manufacturers Technical Support,Technical Bulletins, Repair Facilities etc. Purchase of Equipment for both Sales and Support Teams. If a customer needs help, they expect you to have the exact same hardware to recreate a problem they may be having. Software Adaptation – We need to move our software onto the device and test it for many days. Whilst this task has greatly reduced on Android, there are still benefits of integrating with some device specific features. We currently work with 3 Main Vendors – Zebra Technologies, Honeywell and Datalogic. Please note, we only supply hardware with our software (we are not an Internet Shop for pure hardware sales). We have been supplying the Intermec CN51 Mobile Computer for a few years now. Before that the Honeywell 6100, 6500 and 7600 all of which lasted really well in the field. Some Honeywell 6500 users are still going strong after 8 years! The CN51 has been installed in so many sites now. It is probably a bit more rugged than many of our customers need and is therefore the most expensive unit that we sell. Having said that, we have only seen 3 come back and there are a lot in the field. The unit is designed to withstand multiple drops from 1.8 meters to concrete. We tend to only supply desktop printers that are dedicated to a PC / Laptop. Whilst printing on a network printer is easy, if more than one person is producing tracking labels, there is a danger they will pick up someone elses Tracking Label and put it on their item – from then on, we are in trouble. We have been selling the Zebra Technologies Desktop printers since we started in 2003. Whilst we try other printers (we have a “best of bread” mentality), we keep coming back to the Zebra Technologies units – “simply just work and keep on working”. 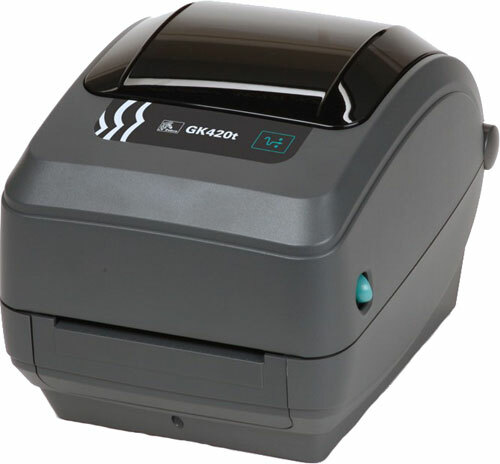 For Mailrooms and other applications, where a barcode needs to last less than 6 months, we suggest the Zebra GK420D (Direct Thermal) as the users only have to ensure they keep a stock of labels. 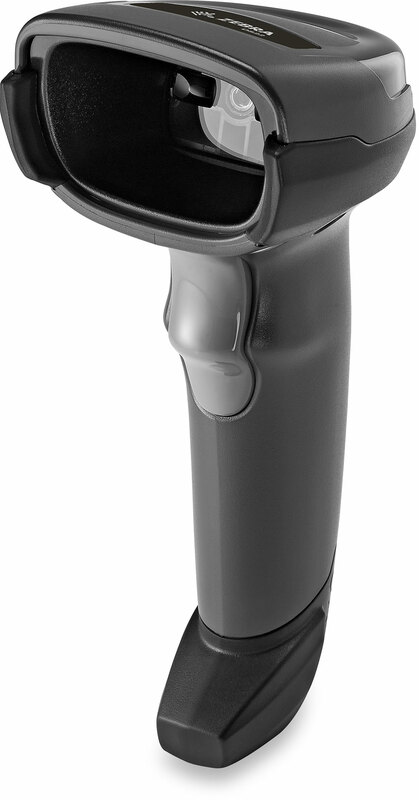 If a customer needs a barcode to last for long periods, particularly in daylight (or ambient light) we propose the Zebra GK420T (thermal Transfer) unit as the labels are not heat sensitive, although it requires a ribbon as well. Using Heat Sensitive labels for a long time in light, just does not work (the label starts to turn black after about 6 months). 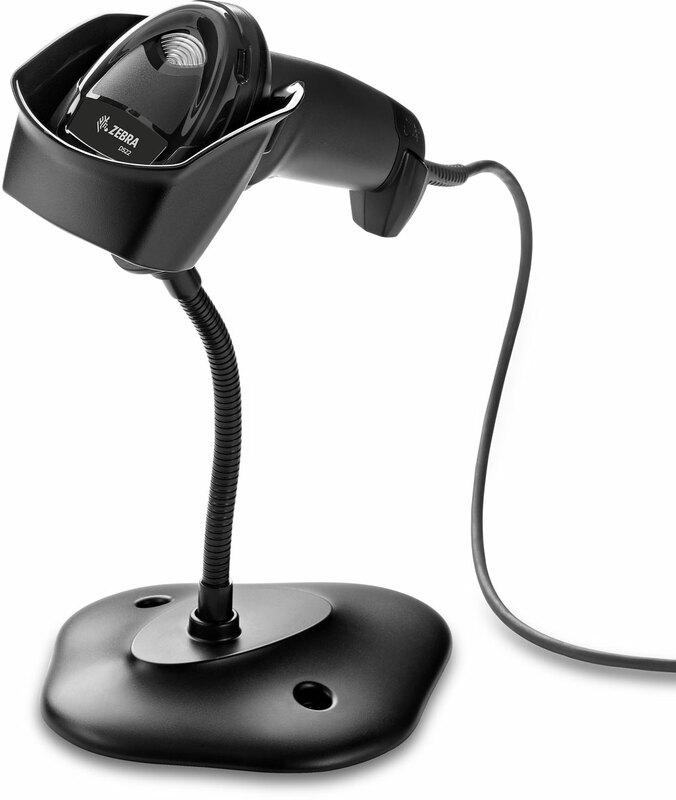 Wireless Scanners (for areas where a cable might be a safety hazard or just an inconvenience). In some situations, you may prefer fixed station tracking (for example a Post Room Counter). In this case, you would use a barcode reader (see section to the left) our PCVersion of Tracking Software and a USB Signature Pad (if you need to obtain a signature). 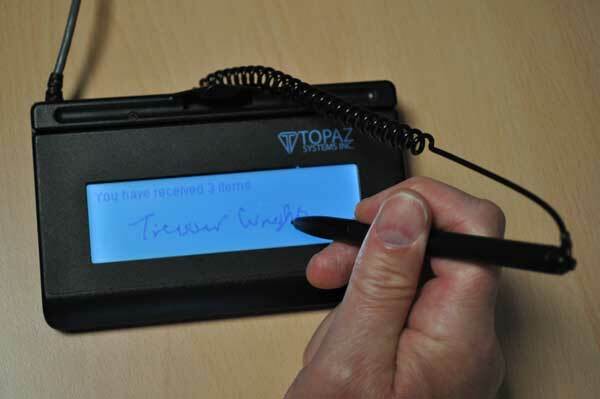 Electronic Ink – as you sign, ink appears to flow from under the pen, so the experience seems very natural. LCD Display which enables us to place a message on the screen, telling the person who is signing, how many items they are signing for. Over 30 Signatures Per Day – we tend to specify signature pads for heavy usage. Should you not need a Counter Mount solution, it should be noted that the TC20 might be a lower cost option. If using the PC / Laptop Tracking Application, you may want the ability to take digital photographs. If this is the case, we supply high definition Auto-Focus Web Cams.